All your favorite posts are now available as permanent articles on our website’s Resources page: https://www.pdx.edu/impactentrepreneurs/resources. At our website, you’ll also learn about our range of programs for aspiring and successful social entrepreneurs and intrapreneurs, from the annual Elevating Impact Summit to our online Certificate in Social Innovation. Check it out and stay in touch for the latest on social innovation. In the latest Federal rankings, Oregon is fourth among US states in job growth, and Portland is eighth among all US cities. How does a small city like Portland create a large footprint in the startup world, while stimulating employment and economic development? We think it’s partly thanks to a great and growing base of programs offering assistance to small businesses. After several years of rapid growth, there are now 35 business incubators, accelerators, and support programs in the Portland area. Beyond working space and crucial programs like mentoring, skills-building, and networking, you may be surprised what resources you can find in this ecosystem of supporting organizations. Need a commercial kitchen? A pop-up shop downtown? A 3-D printer? Alongside the Portland Business Journal’s recent Portland Incubator Roundup, we hope this post serves as your 2016 directory for local incubators helping small businesses thrive. Let us know in the comments if we missed anyone! Impact Entrepreneurs: Embedded in PSU’s School of Business Administration, Impact Entrepreneurs provides an online Certificate in Social Innovation for students and community members, the Social Innovation Incubator for more established ventures, and leadership trainings for the staff of large organizations. HATCH: A set of linked offerings for social entrepreneurs and community businesses, Hatch offers co-working and office space, member workshops and public events, and a platform for equity crowdfunding in Oregon. Best HQ: A business incubator, best HQ provides the support and resources for entrepreneurs to establish and grow their companies, in addition to providing workspace and management and leadership training. CENTRL Office: A collaborative workspace in Portland’s Pearl District providing flexible full-service workspace for leading entrepreneurs, free agents, start ups, and work groups in the historic GE Supply Co. building. Entrepreneurs’ Organization Portland Accelerator : Provides educational small-group meetings for entrepreneurs and ties to EO’s global network of successful business owners. development, mentorship and intern placement. The Indus Entrepreneurs (TiE): Designed to accelerate the successful development of member companies, TiE provides support services including rental space, an incubator program, pitch sessions, and mentors. Mercy Corps NW: Mercy Corps NW supports small businesses and entrepreneurs through microloans, matched business grants, and small business classes taught by business professionals. NedSpace: This co-working resource has 14,000 square feet of great office space in the heart of downtown Portland for co-working, startups, entrepreneurs and remote workers. Oregon Entrepreneurs Network (OEN): OEN is the parent organization for Angel Oregon and the Young Entrepreneurs Society of Portland, and hosts a number of events and workshops designed for businesses at every stage of launch and growth. The Professional Collective: A co-working space in Hillsboro with networking and educational events for entrepreneurs. SCORE: Score is a nationwide nonprofit organization dedicated to the formation, growth and success of small business es with free personal counseling, ongoing mentoring, and 100+ high quality, modestly-priced workshops each year. Small Business Development Centers (SBDC): FREE to Oregon businesses and entrepreneurs, SBDC services include financial, marketing, production, organization, and international trade and feasibility studies. Starve Ups: A virtual incubator and accelerator with peer mentoring as its cornerstone, Starve Ups is an end-to-end educational approach helping companies to survive, strive and thrive. Startup PDX Challenge: Hosted by the Portland Development Commission, this annual competition connects startups to Portland’s growing entrepreneurial ecosystem and provides funding and workspace. TenX: An open source, business frameworks education company, TenX provides content, events, conferences & learning programs to generate growth & acceleration for high potential organizations & individuals. WeWork Custom House: The Portland branch of the well-known global co-working/event space and entrepreneurial community. e1ectr0n : A hardware incubator, powered by Axiom Electronics, that provides manufacturing and engineering capability to startups. Jaguar Land Rover Innovation Incubator: Focused on supporting technology startups developing new in-car entertainment, communications, and interaction technology. Oregon BEST: The Built Environment and Sustainable Technologies Center provides funding, grant connections, links to investors, and research and commercialization support for cleantech entrepreneurs. Oregon Technology Business Center (OTBC): OTBC helps entrepreneurs identify and attain their goals at every stage by providing entrepreneurs with office space, access to coaching, workshops and seminars. The OTRADI Bioscience Incubator (OBI): A bioscience-specific accelerator that provides scientists and young companies with the resources and expertise needed to take their research from the lab to the market. Portland Seed Fund: The Portland Seed Fund is a privately managed fund and non-resident accelerator focused on providing emerging companies the capital, mentoring and connections to propel them to the next level. Portland Startup Weekend: A 54-hour frenzy of business model creation, coding, designing, and market validation, Startup Weekend brings together developers, designers and business people to build applications and develop a commercial case. Portland State Business Accelerator (PSBA): Recognized by the NBIA as the top tech incubator in the US, and by UBI as one of the top 25 in the world, the PSBA offers office and lab space, networking events, and educational workshops for tech and bioscience startups. ADX: ADX is a 12,000-square foot facility that combines membership, fabrication services, classes and co-working to make ADX a hub for design and innovation in Portland. KitchenCru: A shared-use community kitchen and culinary incubator that supports culinary entrepreneurs in developing, operating, and growing a successful business. Oregon State University Food Innovation Center: The Food Innovation Center partners with the Department of Food Science and Technology to provide educational programs and with the SBDC to provide support to local food startups. Oregon Story Board Accelerator: Through mentorship, co-working space, collaboration and networking, the Oregon Storyboard Accelerator is helping a budding industry of digitally-enabled storytellers thrive in Oregon. PCC Getting Your Recipe to Market : In an intensive 14 weeks, this program will help you make your culinary idea commercial ready, with food industry experts that will take you step by step to produce, promote, and sell your product. PNCA Bridge Lab: Provides entrepreneurship development and resources for artists by helping artist-entrepreneurs focus your vision, connect you with business resources, and assist you in building your own personal network in the Portland creative community. Portland State University Business Outreach Program (BOP): Helps local small businesses, including emerging minority and women-owned businesses, achieve their potential by providing technical assistance and business consulting services. Hacienda CDC Community Economic Development: Serving low income microentrepreneurs at any stage of business development, the organization offers a culturally-specific Microenterprise Program that incubates businesses by providing training, access to capital and selling opportunities, affordable commercial kitchen rental and, in the future, retail space at the Portland Mercado. Oregon Association of Minority Entrepreneurs: Participants in the Association can access the Incubator With Walls or the Incubator Without Walls. Both offer market rates, individual technical assistance, counseling with OAME’s staff or volunteers, cooperative marketing and business growth, and development support. is a platform for collaboration with a small group of heart-centered entrepreneurs and opportunity to learn to weave the feminine into your business. Women’s Plaza: opening in 2016, Women’s Plaza will offer co-w0rking space, childcare, catered meals, wellness advisors, and networking opportunities. Note: we periodically update this post to ensure that it remains timely. Last update: April 18, 2016. Header photo by Cacophony, used through CC Attribution-Share Alike license. After seven amazing years at Portland State University, I’m leaving my role as executive director of Impact Entrepreneurs. As with many startup stories, the birth of Impact Entrepreneurs was an answer to a calling with the faith that a vision would come. I started working at Portland State University’s School of Business in 2009 when Scott Marshall hired me to create social innovation programs. He introduced me to Carolyn McKnight, a leadership development expert who had previously held positions as a corporate executive. Carolyn McKnight and I joined forces to launch Impact Entrepreneurs in 2010 when we discovered a shared purpose to create more joy and less suffering through social entrepreneurship and found a mutual respect and desire for collaboration in each other. Since then, we’ve had the honor of working with hundreds of students, social entrepreneurs and changemakers as we have explored social entrepreneurship together and worked to strengthen each other and the field itself. Working with many of you directly, I’ve gained more than I could possibly ever offer in return. You’ve shared your greatest dreams and vulnerabilities as you’ve navigated the discomfort and thrill of creating something from nothing. It has been humbling, exciting, and even heartbreaking. Social entrepreneurship can be addictive and temperamental like that. In partnership with you and a coalition of colleagues and organizations, our small but mighty team at Impact Entrepreneurs has built an internationally recognized program that has directly educated thousands who have, in turn, touched millions of lives. Two of the many highlights for me were the realization of our Business of Social Innovation Certificate, funded by the reTHINK: PSU Provost’s Challenge, and our selection to the Ashoka U Changemaker Campus consortium. Our core team members Jacen Greene and Abby Chroman have dedicated their innumerable talents and resilient attitudes toward making our programs shine and thrive. Carolyn and I are pleased that Jacen will continue leading Impact Entrepreneurs’ core programs in the School of Business Administration as Program Director. In addition, Abby will continue providing project management across our suite of programs. It’s been a gift to expose people to social entrepreneurship over the years and see their eyes and minds light up. It’s been almost 20 years since I first heard about social entrepreneurship. Only one person I knew had heard of it, and she taught me! My life was calling me to align my work with my purpose, and I was all in. I believe now more than ever that business can and MUST be a force for positive change. From what I can gather, there are now millions of people who share this belief. It’s powerful to be in such great company. While sometimes I pine for those “Wild West” days of social entrepreneurship when it felt like we were just making it all up, I am heartened that we now know so much more about what it takes to build high-impact social ventures. Businesses matter because they are uniquely able to build velocity and scale. A single company can get products and services to millions and even billions of people. It can inform and educate. It can make life-saving choices readily available. That’s why I want to see “do-better” businesses succeed and grow, and it is why I want to help in any way I can. As I reflect on where it all began for me and where I’ve been, I find myself with the opportunity to leap back into the business sector. I’ll be joining the talented team at Koopman Ostbo Marketing Communications as their first Chief Marketing and Impact Officer. I’ll be dedicated to increasing impact internally and strengthening our ties with impact-driven organizations. And I’m delighted I will still be a resource to our community of changemakers. Please feel free to drop me a line any time. Feelings can be boisterous when change is big, and I can tell you that right now joy and gratitude are loud and clear. When life called me to social entrepreneurship nearly 20 years ago, I replied “Yes!” and it has been an awesome adventure. Still, here we are today with much work left to do. Let’s support one another to keep up the good work. I would love to hear from you. What is calling you to take action? What’s new in your life? Impact Entrepreneurs would not have happened if Carolyn McKnight and I had not combined our efforts with optimism and commitment to reaching a future state unknown to us at the time. Just as we could not imagine where we would end up now, I know that Impact Entrepreneurs is poised to achieve bigger things that we can’t even foresee right now. I can’t wait. Here’s to remaining hand-in-hand in the pursuit of making choices that reflect our deepest hopes and dreams for the world, including those in our own lives. Thank you for believing that it’s up to us to make that difference. The full 2016 Elevating Impact Summit playlist is available here. In February 2016, Impact Entrepreneurs’ annual Elevating Impact Summit made a new home on Portland State University’s campus in the historic Lincoln Performance Hall. 450 attendees signed up to spend a full day together. They ranged from members of Roosevelt High School’s Rough Writers program to the Mayor of Portland, to academics, business executives, nonprofit and social enterprise professionals, designers, architects, and more.The event was a meeting place for changemakers working across professions. The presentations, performances, and discussions demonstrated creative ways individuals and teams are creatively solving pressing social and environmental challenges, and introduced the promise of social entrepreneurship and innovation to a broad and diverse audience. Quotes, reflections, and memories from the event are captured on Twitter, in a YouTube playlist, and in photos on our Facebook page. We’d like to share just a few of them with you below. We encourage you to keep the momentum going: follow up with your connections from the event, take the next (or first) step toward unleashing your vision no matter what stage of your career you’re in, and collaborate with fellow changemakers to truly elevate your impact. If you are interested in Impact Entrepreneurs’ certificate in the Business of Social Innovation and other programs, you can find information at pdx.edu/impactentrepreneurs or email the team at impactentrepreneurs@pdx.edu. are filled with the beautiful sight of changemakers. onto the scenes of a broken city. scales with the tactics of loving hearts. because their hearts said so. first steps they will never pass go. and you are the future. This interview features Genevieve Martin who will be presenting at the 2016 Elevating Impact Summit along with Dave’s Killer Bread CEO, John Tucker in an intimate interview with PSU Assistant Professor Rachel Cunliffe. Tickets for the Summit are available here. Before the Impact Entrepreneurs team met Genevieve Martin in person, she was a student in PSU’s online Certificate in Social Entrepreneurship and Innovation at PSU. She was an intrapreneur, beginning to develop a new social venture inside an existing company. Over the course of the next year, Genevieve skillfully applied the social innovation tools from the certificate to her real-life professional challenge. By the time we went to visit her work, at the Dave’s Killer Bread Breadquarters, Genevieve was already launching the Dave’s Killer Bread Foundation. We sat down with her to hear her story. Impact Entrepreneurs: What’s your history with Dave’s Killer Bread? Genevieve Martin: I was hired five and a half years ago by Dave’s Killer Bread to start the Killer Café. At the time, the headquarters and production facilities just had this tiny little break room, so my job was to make it into a place where every employee would receive free, nutritious meals, snacks and beverages . My previous experience was in managing front and back of house operations with food service ventures, so this all seemed within reach. But my job grew quickly. One of my new responsibilities included running the small company store and its donations, which were from a percentage of store profits and product. The donations were given as unofficial, no-strings-attached gifts and at that point the criteria for giving was that the recipient was an organization near and dear to the family’s heart. Everything we donated was coming directly off the shelves of the store. While we loved giving the stuff away, we were losing a potential chunk of profit in the process. Being a little more “corporate America” minded, I thought, let’s create some structure here. This part was easy! We hired someone to help with requests and outreach, and then, two years ago came up with a formal grant program to decide who we gave to, and why. We provided donations to a variety of organizations from yoga programs, to youth programs, to conservation. They didn’t exactly relate to second chance employment, but at least we had a giving structure in place. IE: Then what happened that put you in the second chance employment space? GT: So it’s a kind of sad story. First, I should point out that we’ve always hired people with criminal backgrounds. But two years ago we lost a couple of internal leaders to recidivism and drug use in quick succession. They had both started at Dave’s as hourly workers and been promoted up within their departments with supervisory responsibility. John Tucker, our new CEO surprised us. Instead of saying, “let’s stop doing this,” John said, “what are we not doing?” I knew then that this guy was serious. From there we piloted a few programs, including a peer mentoring program and a leadership skills series to see what might work best. Finally we just started collecting and sharing a bunch of resources where we could point people who were struggling. With that one, we started to see a change. People saw that we weren’t just a place to punch in and punch out. Another outcome from the pilots was that we realized we need to understand the reentry landscape better. We knew it was important to hire people with criminal backgrounds, and we were really proud of doing that, but it kind of ended there. So I proposed we host an event where we would bring together government and nonprofit, and any business partner that was interested in talking about the state of reentry. My goal was 50 people and we ended up with 86. It was standing room only at the Westin, and everyone was leaning in. Halfway through that event John came up to me and said, “You need to hire another you.” I said, “Really? Are you officially telling me I can do that?” He said, “Yes, let’s talk next week.” Three months later ‘dI hired our now full-time foundation Program Manager and was in a position to propose and execute next steps. Which was…. amazing…and really scary. The conference revealed that what is missing from the landscape are employers willing to accept people with criminal backgrounds and openly discuss it. We chose to create a corporate foundation because it would allow us to leverage additional funding streams, rather than keep it in house. It also built in the added commitment that this work is so important that it can stand on its own. .
IE: Can you say the Mission of Dave’s Killer Bread Foundation? GT: To expand employment opportunities for people with criminal backgrounds. IE: What were your big questions now that it was your job to start a corporate giving foundation? (Laughs)… Well, for me this was another “holy !#$%^& moment” where I had to grapple with what I was doing here. John Tucker’s confidence in me was encouraging but I needed some more credibility for myself, for external partnerships, and honestly, for internal people to take me seriously. So I started researching nonprofit and leadership management programs. To be honest, academics wasn’t my strong suit growing up and I was hesitant to jump into a laborious program, fearing that I’d be setting myself up for failure. After researching non-profit leadership courses, degrees and certifications I stumbled upon the Business of Social Innovation Certificate at PSU.. I thought this sounds pretty amazing and I immediately emailed for info. After talking to Abby at PSU’s Impact Entrepreneurs I was pretty sure it was what I should be doing, so I took it to John. He was so supportive and offered to move around budgets to cover the cost. It’s a very strange and wonderful feeling to have someone you’ve known a short time see that this is what you are supposed to be doing and make it possible. IE: What have been the most relevant tools you’ve acquired through the certificate program that will help you accelerate this initiative at DKB? The Human Centered Design piece, which was something I hadn’t heard about before, was huge, especially in the beginning. We still use the Business Model Canvas, and I have been using the empathy model from the Business Model Generation book as we put together our corporate goals. We’ve actually been using the Business Model Canvas for each department. Next year the café will do one as an assessment, and the same with the store. That resource was huge. It constantly pops up for me. The customer development interviews, while they seem so simple and straightforward, were massively helpful and new to us. For example, one of our big pieces of work was writing the Second Chance Playbook. We had all these expert pieces of it, and were really struggling to get all the right content in there. Meanwhile, we’re doing the customer development interviews with really fantastic HR professionals who are excited about the work we’re doing, but who tell us basically that they’re not going to have time to read a book. I stopped in my tracks. Of course they don’t! That was my idea to write a book, and I don’t even have time to read one. See all those books on my wall? Those are my you-should-read-these-sometime books, and of course I never do. So that’s completely changed one of our programs. It’s currently in production to be an online set of modules with downloadable content, a program that HR professionals can use as their time permits.. It was uncomfortable to do the customer interviews at first. I’m an introvert by nature and not a salesperson, so at first it was hard to approach people asking them to talk to me as a representative of Dave’s Killer Bread. But then I realized I had this great advantage in that I could say it was for a class project and when I did that, everyone responded very positively. It was so much easier. I recommend every student leverage that. IE: What kind of influence do you think Dave’s Killer Bread Foundation will have? GT: I think there’s potential for it to change the way people are employed, but there’s a long way to go before we see that. The wonderful thing about this work is that it’s ripe right now. There’s a national movement, more people are seeking information, and it’s a great opportunity for us to share what we know. Now it comes down to how we play it out. We have a new acquisition that has a ton of potential for how far we reach, both with our product and our message. The only thing that will get in our way at this point is ourselves! 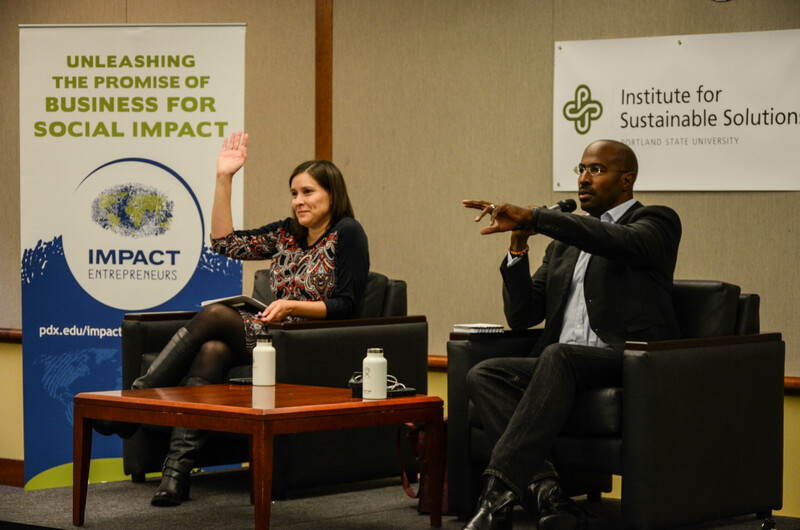 Thanks to Portland State’s Institute for Sustainable Solutions, we recently had the honor of co-hosting Van Jones for a student seminar, dinner and keynote at Portland State University. With experience as a serial social entrepreneur, social justice leader, NY Times best-selling author, CNN commentator and former Green Jobs advisor to President Obama, he has positively impacted millions of lives and changed social and political systems through his work. In his student seminar, Van Jones addressed the intimate group as a friend. “You all seem kind of weird,” he said. “I feel right at home.” Jones responded to questions and quandaries that ranged from fundraising advice to pedagogical theory, the whole time speaking from the heart. It was an inspiring afternoon with a lot of laughs and even a few tears. Do Something: Making a difference is harder than you think, but not as complicated as it seems. The way to make a difference is to do something. If you want to do something big, start small. If you start too big you will get paralyzed by it. For example: If you want to revolutionize education, start by teaching five kids something you know how to do. Salute Setbacks: Once you start doing something, if you do it long enough you will make a lot of mistakes. Everyone does, but you only ever hear about the successes. You will learn the most from the stuff that doesn’t work. Successes are important, but setbacks build character. Keep doing it over and over and you start to get results, staff and money. The next time around it will be easier. Get Out of the PC Thing: You can never be politically correct (PC) enough. No matter how much you are doing, people will attack you for what you don’t do. Focus on doing. If you try to do everything and help everybody, you will get paralyzed. Don’t Impress Yourself out of a Mentor. Competition is not the biggest motivator for people. Our strongest impulse is to nurture. Sometimes when seeking help, social entrepreneurs impress themselves out of a mentor. If you make yourself sound too successful or prepared, your potential mentor may not think you need their help. Share your successes, but also be willing to share your struggles. When someone helps you, they will want to keep helping you…for life. Know What Funders Want: You will need money. Other people have it. You need to know what they are looking for so they will give it to you. Funders are trying to identify three things: 1. That the problem is worth their time; 2. That your solution is plausible; 3. That you are the best person/team/organization to solve it. Final thought: Our education system has taught us to be deconstructionists. We have become experts at breaking things apart and criticizing everything and everyone. We have forgotten how to bring people together to create and initiate solutions. We have to change this. Social entrepreneurship done correctly is about reconstructing, but we have to be willing to let all kinds of people in, find common ground and build together. Do some of these ideas sound familiar? Helpful? What are your top 5 social entrepreneurship tips? Check out Van Jones’ keynote from later that evening. The Portland State University chapter of Net Impact, in conjunction with PSU’s Impact Entrepreneurs, is offering free consulting services for Oregon companies engaged in the B Corp certification or recertification process. This program will give graduate students valuable, hands-on experience working with mission-driven businesses, while providing companies with affordable assistance in improving their social and environmental performance, accountability, and transparency, or achieving recognition for their current efforts. The program will select teams of two to three PSU graduate students to work with the client over the course of a 10-week school term, providing up to 25 total hours of work (an estimated value of $3000) free of charge. The work can focus on the assessment portion of the process (assistance with answering the assessment questions, compiling or analyzing results, providing recommendations for next steps), or on tasks aimed at increasing the client’s assessment score, whether they are certifying for the first time or going through the recertification process. Students will be trained in B Corp Assessment methodology, and all work will be supervised by faculty. Interested PSU graduate students should fill out this form to indicate their interest, or email Emma Ingebretsen (iemma@pdx.edu) and Rich Schwartz (ras22@pdx.edu) for more information. An informational meeting will be scheduled for the 2nd week of the fall term. Interested companies should contact the PSU Net Impact project coordinators, Rich Schwartz (ras22@pdx.edu) and Emma Ingebretsen (iemma@pdx.edu). The project coordinators will work to match the company with a student consulting team. Want to learn more about B Corp Certification and Oregon B Corps? Attend B Inspired on October 15, 2015, to see B Corp leaders speak, join a street fair of local B Corps, and enjoy a concert and celebration. Net Impact is a global community of more than 60,000 students and professionals creating positive social and environmental change through their careers. Individual chapters are volunteer-led and self-directed. PSU’s Net Impact Chapter works to create opportunities for PSU graduate students to gain experience with mission-driven businesses and interact with sustainability-minded professionals. For more information on PSU’s Net Impact Chapter, or to get involved, follow us on Facebook or contact Emma Ingebretsen (iemma@pdx.edu). Founded in 2010 in Portland State University’s School of Business Administration, Impact Entrepreneurs is unleashing the promise of business for social impact. We are a network of individuals and organizations committed to fostering economic, social, and ecological prosperity through entrepreneurial action. Working with partners locally and globally, we deliver initiatives that strengthen organizations, build entrepreneurial impact-focused leaders, and catalyze social innovation. PSU’s School of Business was selected as the best small MBA program in the world by the Aspen Institute’s Beyond Grey Pinstripes rankings for integrating sustainability in business. PSU is also a member of the prestigious Ashoka U Changemaker Campus consortium.